which is located south + 15 miles south of the city Magelang kedu the hilly terrain almost entirely surrounded by mountains, the mountains surrounding the Borobudur Temple in the east of which there are Merbabu West and Mount Merapi, Sumbing Sea and Mount Sindoro. In ethnic Chinese, this temple is also called 婆罗 浮屠 (Hanyu Pinyin: po luo fú TU) in Mandarin. Thus it can be concluded that the drag on the Borobudur Temple was built by the Sailendra dynasty famous in history because as efforts to idealize and glorify Buddhism Mahayana. Borobudur construction period is unknown (estimated between 750 and 850 AD). Initially built-storey apartment layout. It seems designed as a terraced pyramid. but later changed. As evidence of a demolished apartment layout. Borobudur foundation widened, plus two square steps and one step directly circle given a large stupa. Steps on the circle with a large main stupa dismantled and removed and replaced by three railroad circles. Stupas built on top of these steps with a large stupa in the middle. There are minor changes such as making changes to the stairs and curved reliefs above the door. 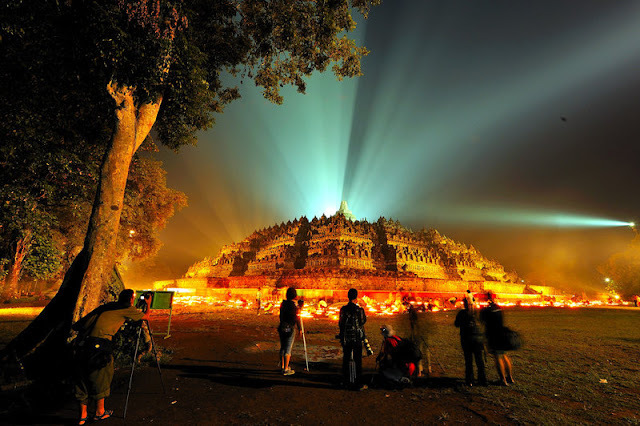 Borobudur the wonders of the world towered among the surrounding lowlands. Borobudur temple that is so forgotten for a long period even centuries - the building is so magnificent in faced with the destruction process. Similarly, because of the long neglected neglected - long in there - here growing variety - variety of wild plants gradually become overgrown and covered buildings. At about - about - century Borobudur 10 abandoned and forgotten. 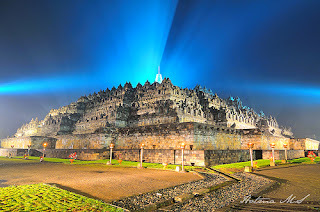 New in 1814 AD thanks to the efforts of Sir Thomas Stamford Rafles Borobudur emerge from the darkness of the past. debris that was covering the temples and remove the soil that covered the halls of the temple in the temple get rid of all that better in comparison before. first - first just done a small - scale and manufacturing drawings - drawings and photos - photo reliefs. although much of the wall or walls - walls especially under level three of the Northwest, North and Northeast are still looked lopsided and very worrying for the visitors as well as the building itself, but the work has been temporarily Van Erp Borobudur can be saved from further destruction large. (PT Nidya WORKS and THE CONTRUCTION AND DEVELOPMENT CORPORATION OF THE filipine). Part - the part that Borobudur Temple is part Rupadhatu pugar ie a lower level of the square, while legs Borobudur Temple and porch I, II, III and stupa facelift participate in the restoration was completed on February 23, 1983 under the chairmanship of DR M Soekmono with inscriptions on a stone weighing mark + 20 Tons. writing of the tablets was signed directly by the experts and skilled workers from Yogyakarta who worked on the restoration of Borobudur temple project. 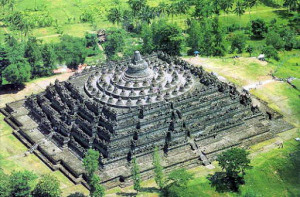 * 1814 - Sir Thomas Stamford Raffles, Governor-General of the United Kingdom in Java, heard of the discovery of archaeological objects in the village of Borobudur. Raffles ordered H.C. Cornelius to investigate the location of the discovery, a hill covered with shrubs. * 1873 - The first monograph published about the temple. * 1900 - The Dutch East Indies government established a committee of restoration and maintenance of Borobudur. * 1907 - Theodoor van Erp led the restoration until 1911. * 1926 - Borobudur restored again, but stopped in 1940 due to malaise and the crisis of World War II. 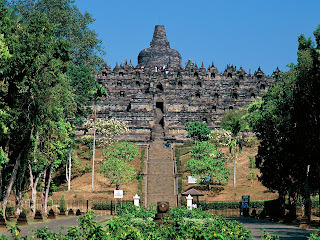 * 1956 - The Indonesian government requested the assistance of UNESCO. 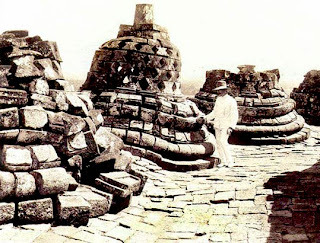 Prof. Dr. C. Coremans came to Indonesia from Belgium to investigate the causes of damage to Borobudur. 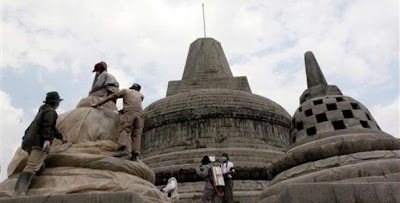 * 1963 - The Indonesian government issued a decree to restore Borobudur, but the mess after the events of the G-30-S.
* 1968 - At a conference-15 in France, UNESCO agreed to provide assistance to rescue Borobudur. 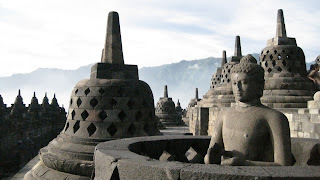 * 1971 - The Government of Indonesia established a body chaired Prof.Ir.Roosseno restoration of Borobudur. * 1972 - International Consultative Committee was formed with the involvement of various countries and Roosseno as chairman. UNESCO-sponsored committees provide 5 million U.S. dollars from the cost of restoration of 7750 million U.S. dollars. The rest is covered Indonesia. 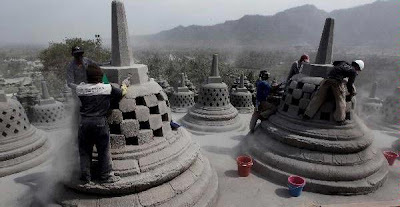 * January 21, 1985 - bomb attacks that destroyed some of the stupa at Borobudur was soon restored. The attack carried out by the Islamic extremist group led by Husein Ali Al Ethiopia. 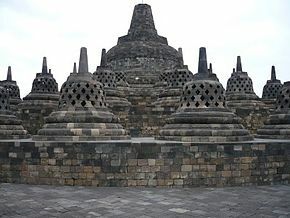 * 1991 - Borobudur designated as UNESCO World Heritage. Many theories attempt to explain the name of this temple.One of them states that the name is probably derived from the word Sambharabhudhara, which means "mountain" (bhudara) where the slopes are located terraces.In addition there are some other folk etymology. Suppose borobudur word derived from the words "the Buddha" is due to shift the sound to Borobudur.Another explanation is that the name is derived from two words "coal" and "beduhur".The word bara said to have originated from the word monastery, while there are also other explanations where the coal comes from Sanskrit which means temple or monastery complex and beduhur meaning is "high", or to remind the Balinese language means "above".So the point is a monastery or hostel located on high ground. 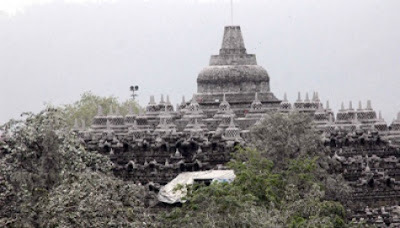 The giant new building could be completed at the time of her daughter, Queen Pramudawardhani.Borobudur Development is expected to take half a century.In Karangtengah inscriptions also mentioned about the bestowal of land sima (tax-free land) by Cri Kahulunan (Pramudawardhani) to maintain Kamulan called Bhūmisambhāra.Kamulan term itself comes from the word meaning first place origin, the ancestral shrine to glorify,possible ancestors of the dynasty Sailendra.Casparis estimates that Sambhāra Bhudhāra Bhumi in Sanskrit means "Hill set ten levels boddhisattwa virtues", was the original name of Borobudur. Borobudur Temple was built using stone Adhesit 55,000 M3Borobudur Temple building a pyramid-shaped staircase - stair steps with the rose in all - four sides (north, south, east and west)at Borobudur no room where people can not get in but could rise to the top only. At the foot of the original stone Adhesit closed by as much as 12 750 M3 corridor undaknya. Borobudur has the basic structure punden terraces, with a six-yard square, three round circular courtyard and a main stupa as a peak.Also scattered in all the court was several stupas. Ten yard owned Borobudur illustrates clearly the Mahayana school of philosophy.Like a book, Borobudur describes ten levels of Bodhisattva who must pass to reach the perfection of the Buddha. The foot of Borobudur represents Kamadhatu, the world is still dominated by kama or "low desire".This section is mostly covered by a pile of stone that allegedly made to strengthen the construction of the temple.In addition to the closed structure there are 120 panels Kammawibhangga story.A small portion was set aside additional structure so that people can still see the relief in this section. Four floors with walls berelief on it by the experts called Rupadhatu. Rupadhatu is a world that has been able to break free from lust but still bound manner and form. This level represents the nature among which, between nature and the natural bottom up. In part this Rupadhatu Buddha statues found in the recesses of the wall above ballustrade or breezeway. Starting the fifth to the seventh floor walls are not berelief. This level is called Arupadhatu (which means no tangible form or not). This level represents the nature of, where people are free from all desires and bond forms and shapes, but have not reached nirvana. Statues of Buddha placed in a stupa covered with holes as in captivity. From outside the statues were still vaguely visible. The highest level that describes the lack of form is represented in the form of the largest and highest stupa. Stupa described plain without the holes. In the largest stupa Buddha statue ever found imperfect or unfinished also called Buddha, who disalahsangkakan as Adibuddha statue, but through further research there never was a statue at the main stupa, which was not completed sculpture was a mistake pemahatnya in ancient times. according to the belief that one statue in the manufacturing process is not to be tampered with. Archaeological excavations carried out in the courtyard of this temple found many statues like this. In the past, several Buddha statues along with 30 stones with reliefs, two stone lions, some kala-shaped stone, stairs and gates are sent to the King of Thailand, Chulalongkorn who visited the Dutch East Indies (now Indonesia) in 1896 as a gift from the Dutch Government as it. Borobudur did not have worship spaces like other temples.That there are long hallways which is a narrow road.The hallways surrounding the walled temple level by level.In the halls is expected to conduct Buddhist ceremonies walk around the temple to the right.Form of the building without room and terraced structure is believed to be the development of a form punden terraces, which is a form of original architecture from prehistoric Indonesia. Borobudur structure when viewed from above form the structure of the Mandala. Borobudur structure does not use cement at all, but the Interlock system is like Lego blocks that can be attached without glue. Buddha statues at a glance it looks like everything but the truth is there are very clear differences differences and distinguish from each other which is the hand gesture called Mudra and is characteristic for each statuehand gesture Buddha statue in Borobudur temple there are 6 kinds just for variety because variety mudra which had by facing all directions (North West and South East) at the Rupadhatu steps V and on the arupadhatu generally describe the same purpose that the mudras number there are five principalThe fifth mudra is Bhumispara - Wara Mudra - Mudra, Dhayana - Mudra, Abhaya - Mudra, Dharma Chakra - Mudra. 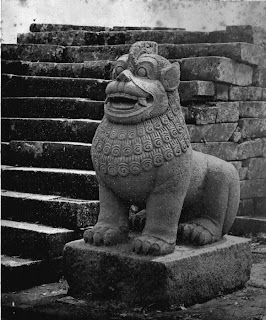 In addition Borobudur Buddhist statues there are also lions lions amount should be no less than 32 pieces but when the count now dwindling due to various reasons the only big lion statue located on the western side of the courtyard facing west as well - if I'm keeping The magnificent Borobudur temple buildings and graceful. - Stupa ParentLarger than the stupa - other stupa and is situated in the middle - the middle of the top of which is mhkota of the entire building Borobudur monument,Stupa stem diameter 9.90 + M's highest peak called pinakel / Yasti Cikkara, located above and also trletak Padmaganda Harmika in line.- Stupa Hollow / OverlayThe meaning or overlay perforated stupa Stupa is located on the terrace I, II, III in which there is a statue of Buddha.In perforated stupa Borobudur whole number 72 Fruit, stupa - stupa is located at ArupadhatuI found 32 Terrace StupaTerrace II there were 24 StupaTerrace III are 16 StupaNumber 72 Stupa- Small StupaSmall stupa shaped stupa is almost the same as the other in the menojol only difference is the smaller size of the stupa of the other, as if - as if a decoration building Borobudur keberadaanstupa occupy niches - niches in step II saampai step to V, while in step I Keben form and partly in the form of a small number of small stupa Stupa there Fruit 1472. 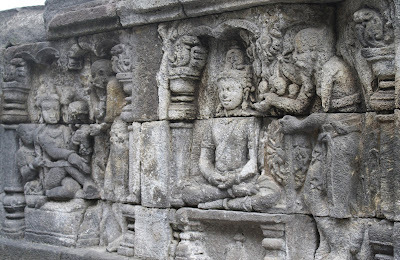 At every level carved reliefs on temple walls.These reliefs read clockwise or called mapradaksina in Old Javanese language derived from Sanskrit meaning is daksina the east.These reliefs variety of story content, among other reliefs Jataka stories. The reading of these stories are always the starting relief, and ends on the east side of the gate at every level, beginning on the left and ends on the right side of the gate.So obviously that the east is the ladder up the real (main) and toward the top of the temple, it means that the temple facing the east while the other sides of similar right. A depiction of the Buddha in a row history reliefs (but not a complete history)which starts from the Buddha's descent from heaven Tusita, and ends with the first sermon in the Deer Park near the city of Banaras.Reliefs lined the stairs on the south side, after a row exceeded the relief of 27 frames starting from the east side of the stairs.The 27 frames are describing activity, both in heaven and on earth, in preparation to welcome the presence of the last incarnation of Buddha Bodhisattva as the candidate.The reliefs depict the birth of the Buddha as Prince Siddhartha arcapada, son of King Suddhodana and queen Maya of Kapilavastu Affairs.Relief amounted to 120 frames, which ended with the first sermon, which is symbolically expressed as a Screening Wheel of Dharma, the Buddha's teaching is called dharma which also means "law", whereas dharma is represented as a wheel. Jataka stories of the Buddha was born as Prince Siddhartha before.Protrusion of the contents is the subject of good works, which distinguishes the Bodhisattvas of any other creature.Indeed, the collection service / good deeds is in the preparation stage of the business to the level of the Buddha's. 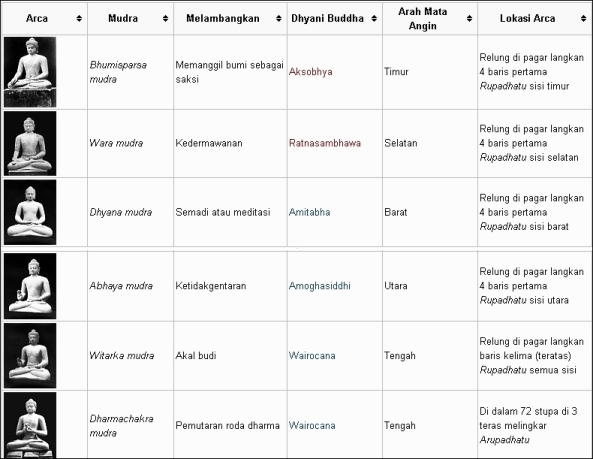 While awadana, basically almost the same but the culprit is not Jataka the Bodhisattva, but others and the stories collected in the book which means noble deeds Diwyawadana godlike, and the book awadana Awadanasataka or a hundred stories.In the reliefs of Borobudur and awadana Jataka, treated equally, meaning they are in the same row without a distinguishable.The set of the best-known of the life of the Bodhisattva is Jatakamala or strands Jataka stories, Aryasura and poet who lived in the 4th century AD. Is a row of reliefs adorn the walls of the hall to-2, is the story of a wandering Sudhana tirelessly in his quest for Top Knowledge of Truth by Sudhana.Description of the frame 460 based on Mahayana Buddhist scripture entitled Gandawyuha, and for the lid on the story of another Bhadracari. Apart form buddha in Buddhist cosmology carved in the wall, there are many statues of Borobudur buddha sitting cross-legged in the lotus position and showing mudras or symbolic hand gesture given. Buddha statue in niches Rupadhatu level, set by the line on the outside of the balustrade.Dwindling on the side of it.Balustrade of the first row consists of 104 niches, the second 104 niches, niches third row 88, row 72 niches fourth and fifth rows 64 niches.Total there are 432 statues of Buddha at the Rupadhatu.At the Arupadhatu (three circular courtyard), statues of Buddha placed in stupas berterawang (perforated).At first there were 32 yard circular stupa, stupa court both 24, and a third court are 16 stupas, all total 72 stupas. Of the original number as many as 504 Buddha statues, over 300 have been damaged (mostly headless) and 43 missing (since the monument's discovery, heads of Buddha is often stolen as collector's item, mostly by foreign museums). On the face of all these buddha statues look similar, but there are subtle differences among them, namely the mudra or hand gesture position.There are five classes of mudra: North, East, South, West, and Central, all based on five main directions of the compass according to Mahayana teachings. I like all about Indonesian culture..